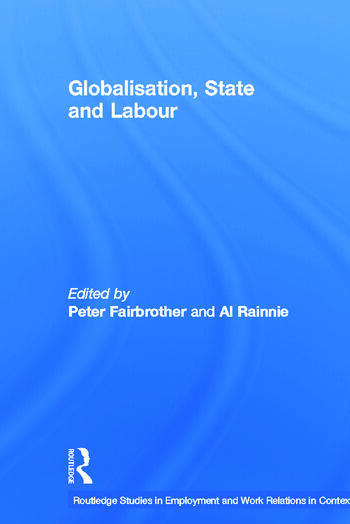 Globalisation, State and Labour combines a new theoretical approach with comparative analysis – ensuring that it will be of vital interest to anyone concerned with the globalization debate, the future of the state, and organized labour. It shows how although the world is undergoing enormous changes involving politics, the economy and society, the position and place of the state, and the significance of state policy in this process, is heavily contested. Presenting a timely opportunity to review and re-assess the modern state with regards to labour, the essays included in this text, written by leading researchers in the area, develop a new theoretical framework that puts work, workers and their organizations at the heart of analyzing state restructuring. Using major studies from four countries (UK, Denmark, Australia and New Zealand), the contributors challenge many preconceptions regarding globalization and labour organization - including the notions that the state is being marginalized by the processes of globalization, and that the trade unions are becoming irrelevant. Peter Fairbrother works at the Cardiff School of Social Sciences, Cardiff University, UK. Al Rainnie is a professor in the Department of Management at Monash University, Australia.